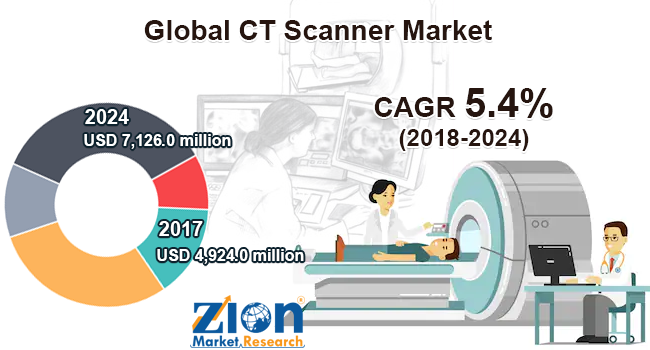 Zion Market Research has published a new report titled “CT Scanner Market by Product Type (C-Arm CT Scanners and O-Arm CT Scanners), by Modality (Standalone CT Scanners and Portable CT Scanners), by Technology (High-Slice CT, Mid-Slice CT, Low-Slice CT, and Cone Beam CT (CBCT)) and by End-users (Hospitals, Diagnostic Centers, Research & Academic Institution, Ambulatory Care Centers, Veterinary Clinics and Hospitals, and Others): Global Industry Perspective, Comprehensive Analysis and Forecast, 2017 - 2024”. According to the report, global CT scanner market was valued at approximately USD 4,924.0 million in 2017 and is expected to generate revenue of around USD 7,126.0 million by end of 2024, growing at a CAGR of around 5.4% between 2018 and 2024. The demographic development along with rising treatment potential leads to a lot of challenges to augment the productivity of the healthcare sector. To get the productivity dive, technology plays a key role. CT scanner is one of the major automated technologies used for diagnostic purpose. CT scan is also referred as computerized axial tomography. CT scanners are the special type of X-ray test which produces cross-sectional images of a body with the help of X-rays and computer. CT scan is a commonly performed procedure. It was first developed in 1974. CT scanners have immensely enhanced patient comfort since the scan can be performed in a less span of time. Technological development has led to higher-resolution images, which helps doctors in making an accurate diagnosis. Owing to developing technologies and innovations in medical devices, the CT scanner market shows tremendous potential for growth over the forecast period. the demand for CT scan is increasing significantly due to increasing priority for minimally invasive diagnostic procedures and rising geriatric population which require home healthcare and bedside imaging. Moreover, the technology advancement and innovative product development such as the advent of portable CT scanners will fuel the market growth in the near future. The global CT scanner market is segmented on the basis of product type, modality, technology, end-users, and by regions. By product type, the market is segmented into C-Arm CT scanners and O-Arm CT scanners. Among which O-Arm CT scanners attribute for the higher market share in global CT scanner market, owing to procedural benefits offered by the O-arm devices such as superior image quality, ease of handling, and reliability. Based on modality, the global CT scan market is segmented into standalone CT scanners and portable CT scanners. The standalone CT scanners contributed to the major market share in terms of revenue. Whereas, increasing popularity of portable CT scanners will boost the segment growth at the highest CAGR. Ease of accessibility and lower switching cost are escalating the number of portable CT scanners installation in the developed market. Technology segment in the global CT scanner market is categorized into high-slice CT, mid-slice CT, low-slice CT, and cone beam CT (CBCT). High-slice CT segment is expected to dominate the market owing to intensifying adoption of CT scan for diagnostic procedures and the extended application horizons of computed tomography during the forecast period. Hospitals, diagnostic centers, research & academic institution, ambulatory care centers, veterinary clinics & hospitals, and others are the key end-user segments of the global CT scanner market. The hospitals and diagnostic centers segment hold the prominent share of global CT scanner market. High preference of patients for hospital diagnostics will boost the hospital segment by end-users over the forecast period; whereas, the veterinary clinics & hospitals segment is expected to grow at a significant CAGR during the forecast period. North America, Latin America, Asia Pacific, Europe, and the Middle East & Africa are key regional segments of the global CT scanner market. North America is anticipated to remain the leading regions over the forecast period. Growth in the region is attributed to high adoption and high installation number of CT scan devices. Due to increasing healthcare infrastructure and rising, government policies for CT scan devices will fuel the growth significantly in the Asia Pacific region. Developing countries like India and China are the most prominent markets owing to the rapid growth potential for market players that are involved in the expansion and promotion of diagnostic devices for the healthcare industry. Some of the key players in CT scanner market include Toshiba Corporation, Accuray Incorporated, GE Healthcare, Medtronic Plc, Hitachi Ltd., Koninklijke Philips N.V., Siemens AG, Carestream Health, Inc., Shenzhen Anke High-Tech Co., Ltd., Neusoft Corporation, Samsung Electronics Co., Ltd., and Shimadzu Corporation. Major players are frequently engaged in mergers & acquisitions to retain their market share and diversify their product portfolio.